Sage advice on engaging with investment professionals from a corporate communications pro. In business, there are certain practicable formulas designed to maximize success in a variety of areas, such as financial analysis, business process management and marketing, to name a few. 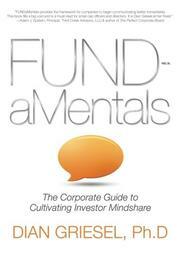 With the publication of Griesel’s book, add to the list a formula for getting investors interested in a company. Griesel’s well-delivered counsel is universally applicable to CEOs of larger public and private companies and owners of smaller companies. The author discusses certain basics—how to create an elevator pitch, how to make a presentation, how to create a business plan—that the reader could find in numerous other business books. But it’s her concentration on the more advanced fundamentals that make this resource valuable. Griesel’s informative discussion of professional fund investors, for example, is insightful: “PIs do you a favor by listening to your company’s pitch,” writes Griesel. “It’s part of your job to satisfy the needs, wants and expectations of PIs, and whenever possible, to unearth their fears or resolve any complaints or reservations that might prevent them from investing in your company.” This kind of blunt talk is likely to keep in check a business owner who may get too caught up in his or her own ego. Her chapter on “The Importance of a Cohesive Management Team” is equally straightforward. It includes two exercises for executives (one is used with the permission of an investment firm) that demonstrate why senior managers must share common goals and purposes and be able to work together. Writes Griesel, “Lack of a unified vision in the corporate suite is a surefire way to obliterate investor interest.” Griesel includes the obligatory chapter about social media but does a nice job slanting it to investor relations. Respecting the senior manager’s time, Griesel writes economically and replaces the fluff with specific suggestions. A well-written, useful guide that should enhance a CEO’s ability to communicate with the investment community and attract new investors.